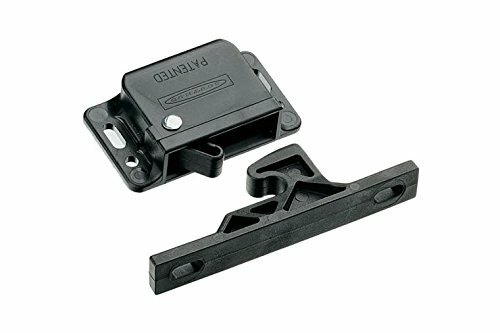 Southco C3-810 Series Passivated Plastic Grabber Catch Side Mount Concealed Push-To-Close Latch with Black Spring, 44N Pullup, Black. Southco Grabber catch side mount concealed push-to-close latches. Get an extra degree of closure force on doors, with this compact latch's internal spring-loaded pawl that provides over-center latching. The built-in pull-up provides tension to help prevent looseness or rattle of the door against the frame. Latching function is accomplished in a relatively low-profile mechanism, just 0.54-inches thick. Over-center action actually pulls door tighter to latch, releasing it when you pull to open door. Feature corrosion-resistant materials. Industry applications includes automotive, passenger vehicles, trucks, electronic enclosures, exhibits/signs, industrial enclosures, vending machines. Maximum tightening torque on mounting screws (not supplied): Catch: 1.1 N m. Minimum distance from frame (or surface on which catch sub-assembly is mounted) to centerline of door hinge is 5.9-inches. Rivet/screw (thru hole) installation. View More In Lock Bolts. If you have any questions about this product by Southco, contact us by completing and submitting the form below. If you are looking for a specif part number, please include it with your message.